We have started on the second part of the 5 paragraph essay, body paragraphs. These follow the thesis statement introductory paragraph and provide supporting evidence with thoughtful, detailed, and convincing sentences that add ammunition to your argument. What? What is the purpose of the passage? How? How is this conveyed? Why? What is it important? 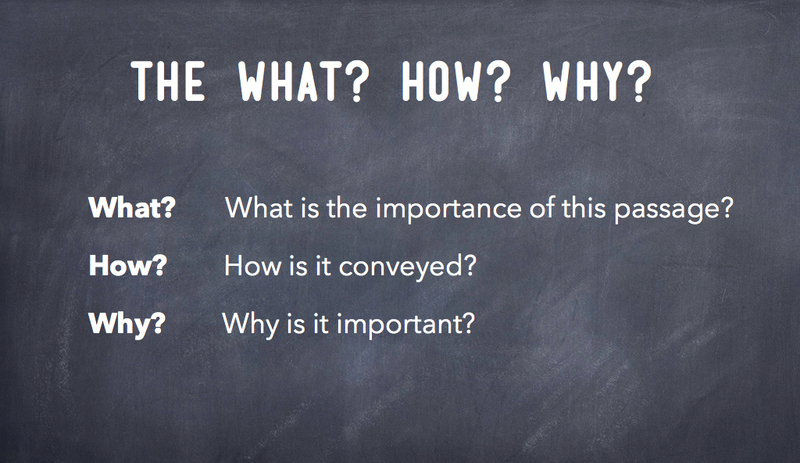 The structure of your evidence paragraph that you are asked to write is with the What? question, the How? question, and the Why? question. Think of the What? as the topic sentence of the paragraph, the How? as the supporting evidence sentences (quote, details, descriptions), and the Why? sentence as the conclusion sentence. Much in the same way you can think about the 5 paragraph essay this way, you should also use this structure to write your evidence paragraphs. This article was written on 08 Feb 2013, and is filled under Homework Assignments, In Class. 5 paragraph essay, close reading, details, evidence paragraphs, passage analysis, thesis statement, What? How? Why?